Donny Cates is one of the busiest writers in comics for a reason. He keeps reinventing genres, putting new more thoughtful spins on age-old tropes. He just finished the great fantasy miniseries, God Country, with Geoff Shaw, Jason Wordie, and Dee Cunniffe. 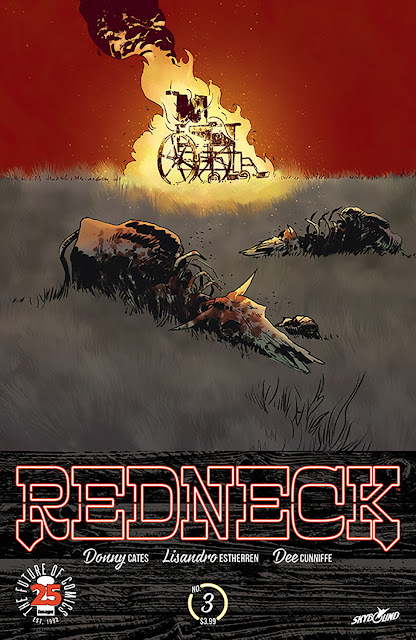 There's a running theme with 'Redneck,' his latest title with Image Comics, that was also in 'Country' - family comes first. It just so happens that this family has a thirst for blood and avoids the deadly effects of the sun for more reasons than a sunburn. Vampire stories have been done and redone but thankfully Cates emphasizes the familial aspects over the sensational gory ones. With that said, this issue starts off where issue #2 left off with a bloody mess. Cates bypasses the entire fight that leads to the aftermath. It's an interesting decision which works because the results speak for themselves. Dead bodies, dismembered bodies, half living torsos, all over the front yard. Whatever happened it was a blood bath. What matters isn't so much the fight we didn't see but how it'll impact J.V. and company. They had committed themselves to keeping a low profile but a family member is murdered and the family BBQ joint is torched. The time for hiding is over. There's a generational gap in the Bowman household. Granpa is old school and he'd destroy all non-vampires if he could. He's bound to a wheelchair but can still punk Bartlett when he wants to. Granpa isn't impressed with the younger Bowmans. JV thinks he can blend into society while keeping true to his self but Seamus and Greg have had enough. They're driven by vengeance to find Slap's killers. It consumes them and really ratchets up the tension in the issue. Bartlett seems lost without a plan as JV checks out for most of the story. Things keep escalating and there promises to be some reckoning coming now that the Bowmans' lives have been turned upside down. Lisandro Estherren and Dee Cunniffe really find a rhythm with the art. Estherren's sketchy lines and graphic violence adds a sense of energy to the story that counterbalances the quieter moments of dialogue elsewhere. There seems to be more consistency with regard to detail in this issue than others but Estherren seems the perfect artist to convey a dark rural horror story. Cunniffe's colors are mostly dark, earth-toned, but effective in grounding this supernatural story with gritty textures and flashes of brightness. The flashback sequence in particular works because of the use of spontaneous splashes of exploding color. 'Redneck' is a book where things are escalating. Cates is leading us to something big. The Bowmans are being dragged into the light, forced to fight back, and the youngins are more than willing to even if the elders aren't. 'Redneck' really is a vampire book unlike any other. It's about how a family survives a greater threat while conflicting ideas within that family steer their future. 'Redneck' is smart, gory, and captivating.